In order to demonstrate how to get started with Sitecore and MVC Areas we will first need to create an Area within our Visual Studio development web project. Rather than explain in detail how to do this here I’ll refer you instead to this excellent post on [ASP.NET MVC] Routing – Areas. 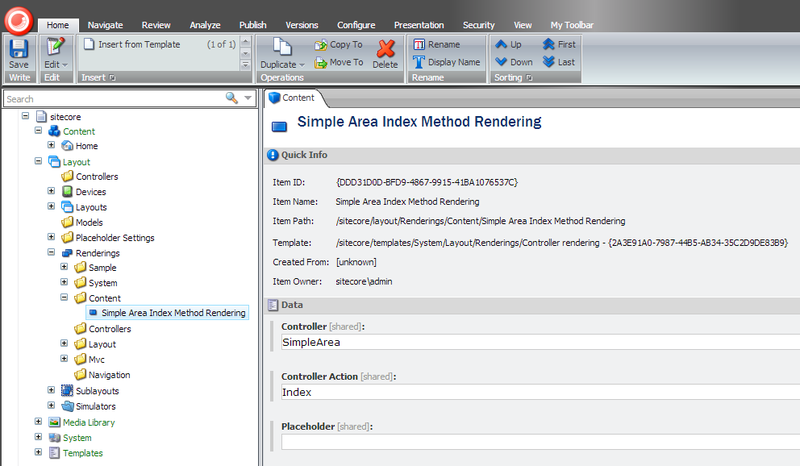 The screenshot shows a single area, MyArea, within a development web project. The area itself has a single controller named SimpleAreaController containing the Index method shown in the following code listing. In Sitecore create a new Controller Rendering item based on the /sitecore/templates/System/Layout/Renderings/Controller rendering template. You’ll need to specify the Controller and Controller Action field values. The controller field value in this simple case can be specified using the same convention-over-configuration naming that ASP.NET MVC employs, that is use the controller class name minus the Controller suffix. The controller action field is used to specify which method on the controller to invoke. Now add the rendering to an Item’s presentation details and then preview the Item to verify that content generated by the controller method is getting displayed on the page. So this is the simplest thing to get started with Controller Renderings and Areas. The fact that you are targeting a controller located within an Area has had no impact on how the field values for the controller rendering are specified and would be the same if the controller was located outside of an Area. Having a controller action method return simple strings to the browser using the Content method is not a very realistic example. A more common scenario is where the action method performs some processing and on completion passes a data object to a View for rendering. This behaviour is shown in the following example. The Index.cshtml view file simply writes some different HTML content along with the model value passed to it by the controller action method. If you go ahead and try this out by updating the code within your action method you are likely to run into the first gotcha. As of Sitecore CMS 6.6.0 rev.121203 (Update-2) there is a known issue with locating view files invoked from a controller within an MVC Area. The workaround to this problem is to simply specify the path to the razor view when calling the Controller.View method. 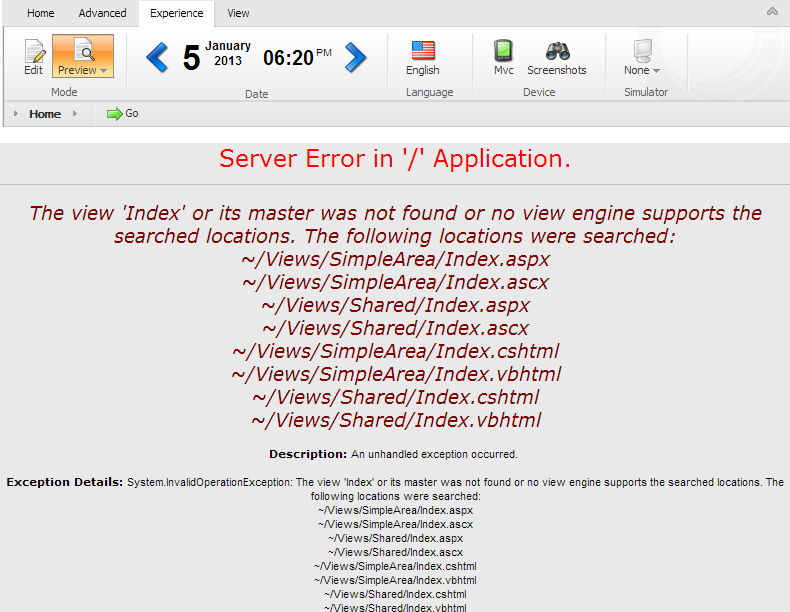 After specifying the path to the view the server error no longer occurs and the output from the razor view is sent to the browser. 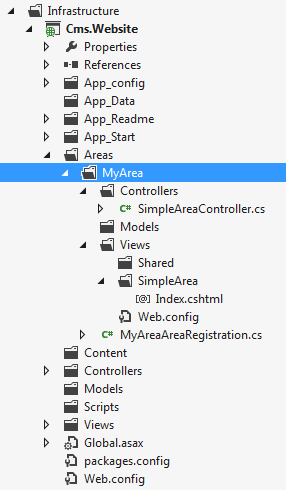 This post has hopefully shown you enough to get started on using MVC Areas with Sitecore 6.6. More guidance on topics such as avoiding name collisions when using multiple MVC Areas will be covered in the next part of this article which I hope to post shortly. Please feel free to leave feedback on this post or provide suggestions for any other Sitecore MVC topics that you would like investigating. This entry was posted in Sitecore and tagged ASP.NET, MVC, Sitecore by kevinobee. Bookmark the permalink. The real solution would be add a new rendering type with third field called “Area” and add it to the route values colleciton when executing the controller. I did this before in the early builds but it changed so much it would take some time to recode this. Thanks Kevin. Would you be prepared to share your code with a view to getting it added to a MVC Contrib project for Sitecore? The problem is the core code changed so much that my code isn’t relevant anymore. If I get a break I’ll try to get it working again. Blog post, source code and package. Added more support to load MVC Areas from multiple MVC project, MVC Form POST and some more in cooking.